We aim to provide clinicians with the necessary information and resources in order to gain a better understanding of the concept of patient safety and to enable them to mitigate patient safety incidents within their own practise and clinical teams. Is Patient Safety an Issue in Oral Surgery? Yes, as Oral Surgeons, we perform a high volume of multi-site complex procedures on anxious patients who are frequently conscious that have the potential for error to occur; these errors are more likely to occur due to the number of teeth and contra laterality, including issues with charting and supernumerary or impacted teeth. Patients are increasingly encouraged to take an active role in their own healthcare. Patients can act as ‘safety buffers’, but the responsibility for patient safety still lies with the clinician. “Serious incidents that are entirely preventable as guidance, or safety recommendations providing strong systemic protective barriers, are available at a national level, and should have been implemented by all healthcare providers. Wrong tooth extraction has been clearly designated as a Never Event since April 2015. Wrong tooth extraction continues to top the charts as being the most frequently occurring Never Event based on NHS England’s data. The latest figures show that during 2015/16 wrong tooth extraction was reported 33 times by NHS Trusts in England, this was the second most frequent never event for that year. During 2016/17, the figure had risen to 42 making wrong tooth extraction the most frequent never event in England! We must also note that this figure will not include wrong tooth extractions that occur in primary care dentistry as there is no way of reporting these incidents at the present time. What can we do to mitigate these incidents? 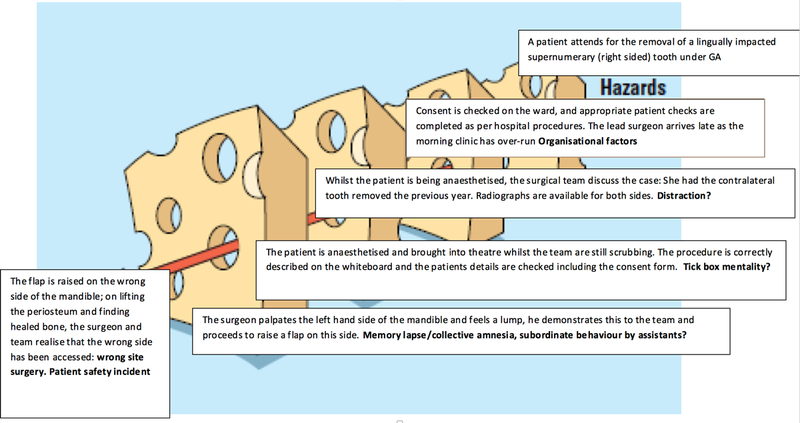 BAOS Council Members have been involved in the introduction of Correct Site Surgery Policies in several Oral Surgery departments across the country and have conducted original research into Patient Safety in Dentistry and Oral Surgery. Tara Renton recently chaired the LocSSIPs (Local Safety Standards for Invasive Procedures) panel for Dental Extractions at RCS England. Supporting the clinical team throughout the process and not taking punitive action when incidents do occur. The clinical team check that the correct patient is present and that all of the necessary clinical information and equipment is available and functioning. At this point, the clinical team pause in order to run through the checks to ensure that the correct treatment is about to take place. The LocSSIPs group decided that this should include a two person check with the assisting clinician or nurse. The correct procedure is verified and the clinical team discuss any problems encountered and decide how to learn from these for future procedures. 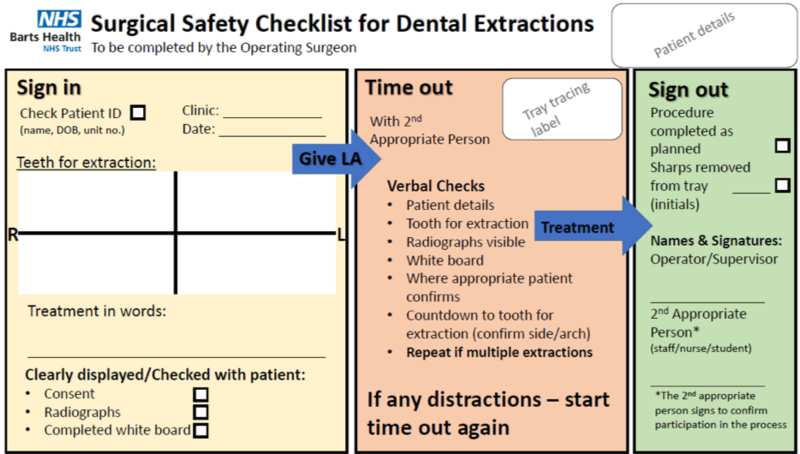 LocSSIPs pathway for dental extractions – RCS England and NHS England.